The best sea, the hot Sicilian sun, the smell of a town that means summer in Sicily. 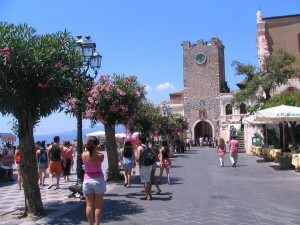 If you are planning a weekend in Taormina, maybe it’s your chance to reconcile yourself with the world. Diving into the crystal clear water, have dinner in a fine dining restaurant and finally walking through the street of shopping in the most fashionable town in Sicily. But Taormina is not only simple fashion, there you can’t miss the local produts, to taste like marzipan or to admire like colorful pottery items. Corso Umberto is the main street of shopping. There you can find Musumeci, an elegant boutique founded by Mirella and Maurizio Musumeci who made it very refined both for a sought choice of brands and for the care of the store layout, with pure leither sofa inside and stone columns inside the shop windows. A few steps further, you find Parisi, a boutique with an old family tradition; in fact it was born as tailor’s shop, then it became a store specialised in custom-made man clothing. Now it is a prestigious boutique for man. woman and kid of the best Italian and international fashion brands. As we told you before, in Taormina the best shops are not only the fashion ones. You can’t really miss the original marzipan fruits, so sweet and colorful, in exposition in the ancient and traditional shop La Bottega del Buongustaio, the heart of Taormina for the Sicilian food lovers. Last but not least you have to visit Saro, the most famous antiques shop of Taormina. It has a very typical Sicilian setting: the façade is covered by ivy and the shop is so colorful and full of different items: from the straw woven traditional bags, made with various kind of cloth, decorations and details, to the representation of the true Sicilian culture: i pupi, characters of the Sicilian marionette theater.